The kidneys are a set of bean shaped organs, each approximately the size of a fist. They are located near the middle of the back, just below the rib cage, with one on each side of the spinal chord. The kidneys are important, as they function to clean the blood and remove unnecessary waste products. They handle approximately 189 litres of blood per day, of which they remove 1.8 litres in waste and extra water. 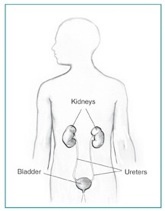 After filtration by the kidneys the waste and water become urine which reaches the bladder through tubes called ureters. 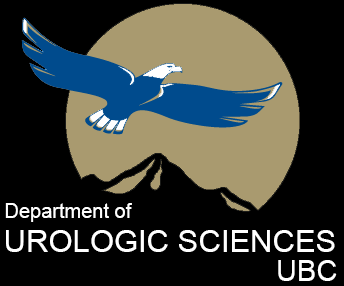 The urine is stored in the bladder until it is released via urination. The waste that is removed by the kidneys is a byproduct of our normal metabolism, the removal of important compounds from the food that we ingest by the body. If the kidney did not remove these wastes, they would build up and cause serious damage to the body. 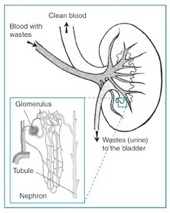 The removal of waste products from the blood takes place in “tiny factories” within the kidneys called nephrons. Each nephron contains an area where a single blood vessel (glomerulus) is intertwined with the tubule, which is the tube where urine is collected. The glomerulus acts as a filter, keeping important proteins and molecules in the blood and allowing waste to move into the tubule for removal in the urine. Even though this system is very efficient, small amounts of useful materials and minerals can still be filtered into the tubule. The kidneys measure the levels of chemicals such as sodium, potassium and phosphorous and allow them to be taken back up into the body as the urine passes through the tubules. This way the kidneys ensure that the correct balance of these important chemicals is maintained.